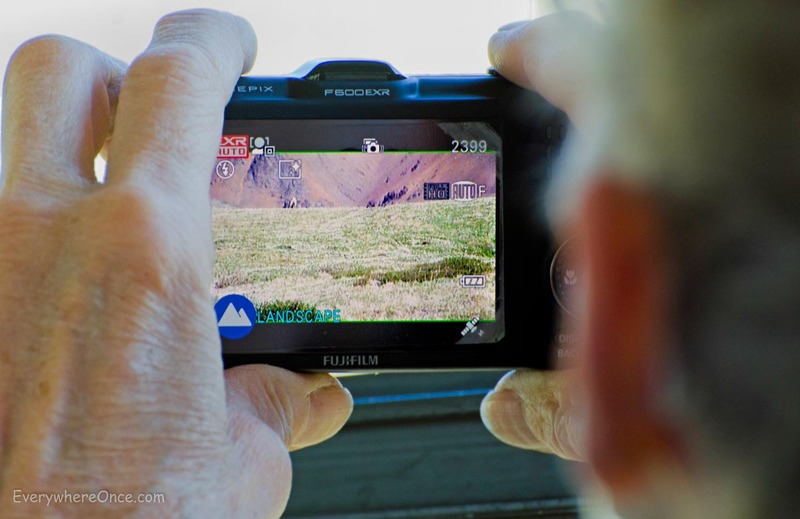 We had a stormy relationship with Alaska’s Denali National Park; turbulent at first but then growing into a kind of appreciation and fondness. Things would have gone smoother had we understood Denali peculiarities from the beginning. Even under the best of circumstances, visitors may find Denali to be a bit of a mixed bag. But forewarned is fore-armed, as they say. So here’s what you can expect from America’s third largest park. The Good: Wonderfully dramatic scenic views. 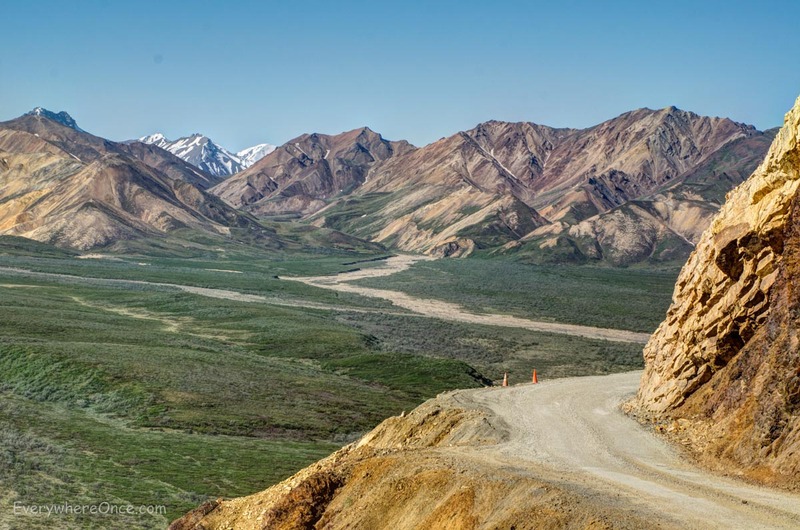 We thought we had seen this part of Alaska on our nearly five our drive to the park, but the 66 mile road winding though Denali amped up the beauty to a whole new level. The Bad: You’ll need to take a tour bus (or walk or bike) to see most of those 66 miles. No cars are permitted past the 15 mile mark. The Unforgiveable: Massive Misinformation. Our trip into the park was nearly ruined by bad information from a ranger at the visitor’s center and compounded by terrible disclosure in the Park’s printed material. Forget what you think you read on the website, the buses you want into the park are neither free nor inexpensive. Expect to pay upwards of $50 per adult to get where you want to go. The earliest bus departures need to be booked in advance. If you’re hoping to see wildlife, the 6:00 AM, 6:30, or 7:00 buses are your best bet. But don’t make the mistake we made by showing up in the morning looking to buy tickets. The ticket window will not accept walk-up purchases for these departures even if seats are available. The website for booking tickets does not recognize National Parks Passes. If you book online, you’ll be charged a park entrance fee regardless of whether you’ve already bought an annual pass. You then have to bring your pass to either the Riley Creek Mercantile or the Wilderness Access Center to get a refund. Denali is the only U.S. National Park we’ve visited that charges for mandatory bus service (most offer regular and complementary hop-on-hop off bus service), so that caught us a little by surprise. So too did the seemingly arbitrary early-morning reservation requirements. Neither of which would have been a problem if someone at the park’s information center we visited the day earlier for the sole purpose of learning these things explained that to us. Instead we were handed an inaccurate bus schedule, told nothing about bus fees, or reservation requirements and as a result got shut out of the prime departures we got up early to catch. The park’s literature wasn’t much more helpful. Page Six of Denali’s visitor newspaper has a section titled “Making the Most of Your Visit” that mentions its free shuttle service but fails to indicate that the free shuttle doesn’t really get you into the park. It’s not until Page 18 where you learn that the buses you actually want aren’t free. You have to get to page 20 to discover the need to pre-pay to book seats on certain buses. Considering that Denali operates quite different from all our other National Parks, spelling out exactly what you need to do to get around the park should appear on page one and it should be the first thing off the lips of anyone working in the information center. That wasn’t our experience. Notwithstanding the hassle, there’s good reason you’re not allowed to drive here. The Good: Mandatory bus service is understandable. Denali’s roads are not ones most of us want to drive, or at the very least, are not ones we’d like to drive on with others. With narrow gravel roads, blind hairpin turns, steep grades, and long drop-offs, we were happy to leave the driving to someone else for a change. The Good: Wildlife. 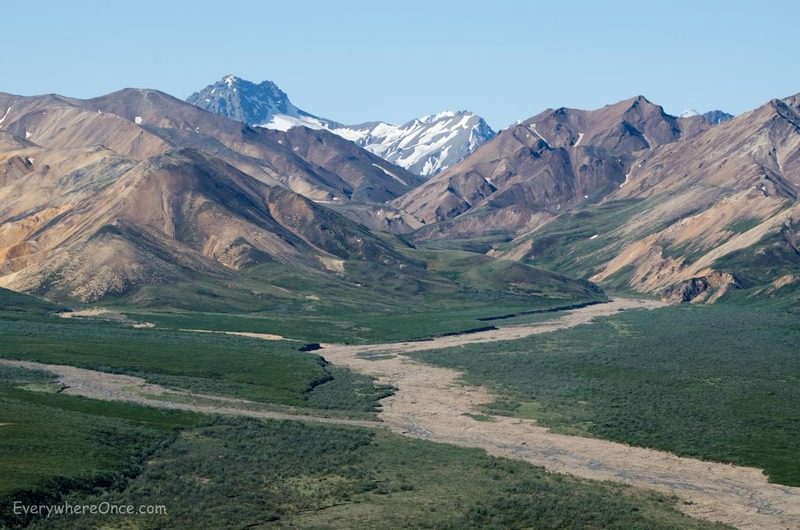 Denali’s 6 million acres of untrammeled nature is teaming with critters. 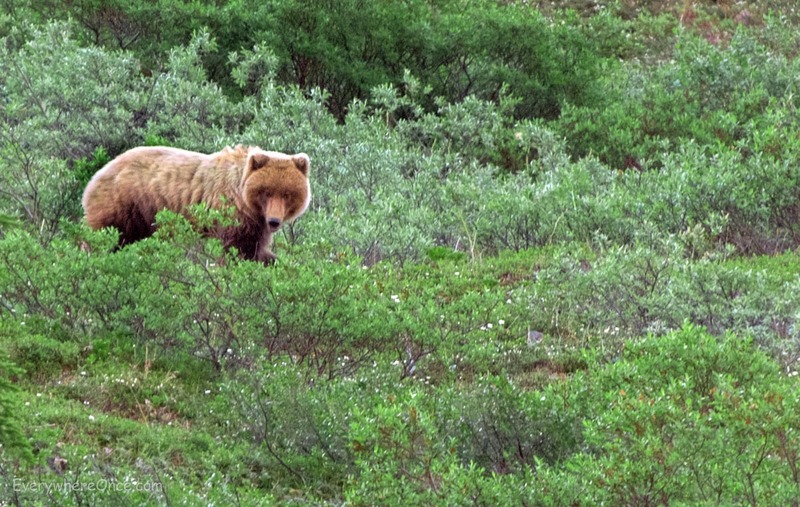 Our first and only grizzly bear sighting. The Bad: Wildlife is wily and spotting it is no sure thing. After all, they have 6 million acres in which to evade you. During our time in the park we saw just one bear, one moose, and a couple of caribou. We’re always grateful whenever wild animals choose to grace us with their presence, but we met a lot of people who left the park disappointed. It wasn’t the safari-like experience many had traveled thousands of miles for. The Ugly: If critters happen to be on the other side of the bus, your best view may look like this. This is how you may end up seeing wildlife on the bus. The Consolation: Furry rangers. You’ll easily find Denali’s dog sled team all summer long. The Good: There’s no need to stay on the bus. Most of Denali’s 6 million acres of wilderness are open for exploration on foot. You can use the bus as transportation, get off where you want, and use your time to explore on your own. The Bad: There are very few developed trails in Denali. If you’re unequipped for back country bushwhacking, like we were, then it’s the buses and the masses for you. The Good: Insect repellent works surprisingly well. The Bad: You’ll need lots of it. Alaska’s State Bird, the mosquito, descends in clouds here. The Good: Mount McKinnley is an awesome sight to behold. The Bad: Consider yourself lucky if you actually see McKinnley. Clouds cover North America’s highest peak 3 out of every 5 days. We were extremely lucky to hit Denali during a rare clear streak where the mountain was out eight days in a row. 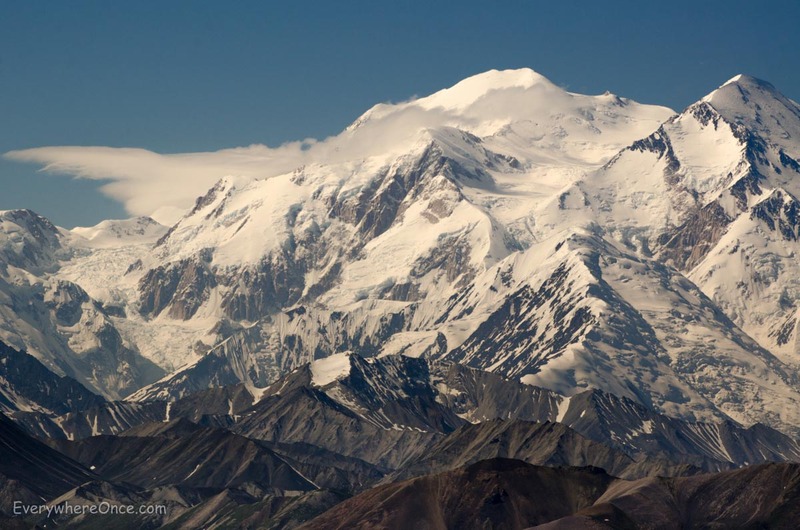 The Verdict: For the lucky, the patient, or the hardy, Denali can be an awesome national park. We consider ourselves among the lucky. If your plan is to spend a single day touring Denali by bus like most tourists do, you’ll have a hit-or-miss experience. It’s possible you’ll see McKinnley in all its glory along with a host of wildlife. It’s also possible you’ll see none of that. 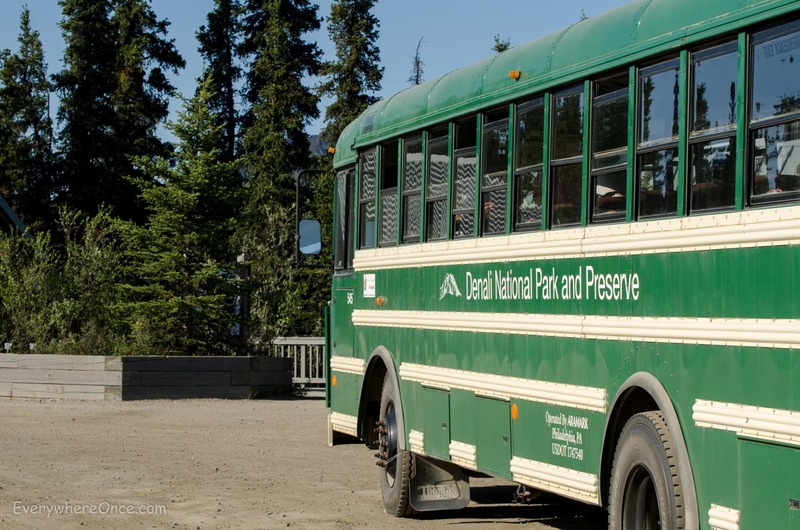 You can increase your chances for wildlife encounters and overall adventure by leaving the bus behind and exploring Denali by foot. But to do so, come prepared for off-trail hiking. And don’t forget to bring a head-net. We visited Denali about ten years ago and after all my pre-trip planning, I opted for us to stay at The Back Country Lodge. The six hour drive was amazing with the driver explaining the braided rivers, pointing out wildlife (hohum, another caribou!) and finally, the mountain. The magnificence of the mountain is partially because almost all its height is visible since elevation is relatively low at the base. I don’t know what it is that makes McKinley so special – it’s height for certain – but maybe, also, the way it looks like a giant, rounded, scoop of shaved ice. Totally unique. This info will be really valuable for visitors to Denali. Thanks for sharing all this helpful information. That had to be quite a frustrating and disappointing experience. Stunning country though and you’ve captured some beautiful scenery. Thank you. Yeah, after having visited ~80% of our national parks, I guess we thought we knew how things worked. Denali is a bit different and it’s good to know that in advance. Breathtaking scenery Brian. Thank you for the great information, hopefully we’ll get to experience Denali in the future. Useful information if I ever get there! Sounds amazing… a brown bear!